… or: “Cross Browser display:inline-block”. Usually at this point you stop bothering and use a table, right? 😉 But what about liquid layouts? 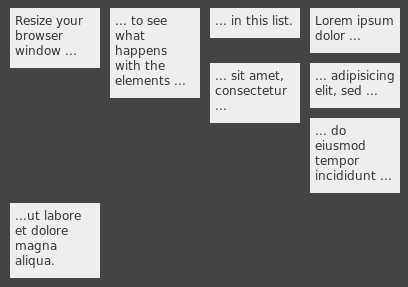 It would be nice to have “something” that can do the trick with a simple unordered list (ul). Actually, CSS has a solution for this problem: setting the item to display:inline-block will do. There’s just one minor problem. inline-block is currently only supported by Safari and Opera in a usable way. There are workarounds for Internet Explorer and Firefox. The one for Firefox is extremely buggy, especially when it comes to manually setting the width of an item or when wrapped text should be supported. I combined the workarounds and found a way to deal with fixed widths of items which results in a cross browser solution for the problem. Check out the demo. Lets have a deeper look into the six tests of the demo page. All tests are using the exact same markup for the lists – no quirks here ;-). Safari and Opera are fine with that – Internet Explorer and Firefox are not… They still display our items as regular block elements. Yeeha – that does the trick! Enough chit chat! How do I use it? The HTML comments are required in order not to have any white spaces inside the “critical section” – we are dealing with inline elements here… See also the limitations section. That’s it – happy aligning. Always keep in mind that you are dealing with inline elements. 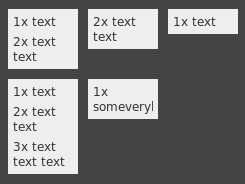 As opposed to block level elements, spaces between inline elements are displayed. The children of a ib-fix layouted element have to be block level elements, i.e. must not be text children.